New Photos - JKids in Action! There’s a lot more meaning and depth to the 613 Commandments than what meets the eye. Join us for our newest class series, Understanding the Mitzvot, and be amazed at what you’ll uncover! FUN WITH FRUITS at JKids in Action - This Sunday! Join us this Sunday for another "Jewish Kids In Action" program, as we continue along with this year's theme, "Kids in the Kitchen!" 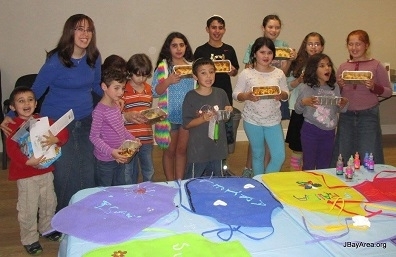 At this JKA we'll be having FUN WITH FRUITS in honor of Tu B'Shvat - the New Year for Trees. 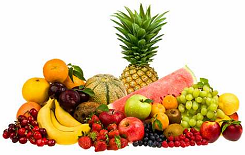 Activities will include making your very own fruit kebab's and fruit smoothies, along with some fun games! 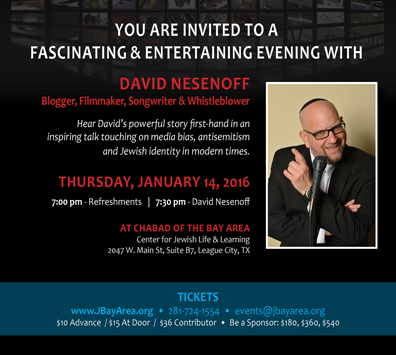 There were lots and lots of laughs, and even a few tears last night, at Chabad Bay Area's - Center for Jewish Life & Learning, as David Nesenoff recounted to a full house his story of accidental fame brought on by his inadvertent yet fortuitous exposure of the anti-Jewish bias of Helen Thomas, the venerated senior member of the White House press corps. David brought it all together with a powerful and uplifting message of how to truly combat anti-Jewish bias and on finding the true answer to the challenge of Jewish identity in our modern age. "Not just a home run, but a grand slam!" "I wish he'd gone on for another hour!" "When are we having him back?" Were just some of the many enthusiastic comments heard at the conclusion of the event. We'd like to take this opportunity to thank the many contributors who helped make this wonderful event possible. 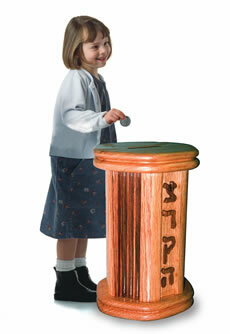 If you are interested in helping to sponsor our next guest speaker, please contact our office. (Pictures of the event will G-d Willing be posted after Shabbat). Hear David's powerful story first hand in this critically acclaimed and inspiring talk touching upon media bias, antisemitism and Jewish identity in modern times. Join the Facebook event page & share! Our sages described them as tools for personal refinement and growth, Kabbalah saw them as connections to the Divine, but one thing everyone agrees upon is that Mitzvot form the very fabric and essence of Judaism. Matzah or Mezuzah, Shabbat or Kosher, there’s a lot more meaning and depth to the 613 Commandments than what meets the eye. Join us for our newest class series, Understanding the Mitzvot, and be amazed at what you’ll uncover!